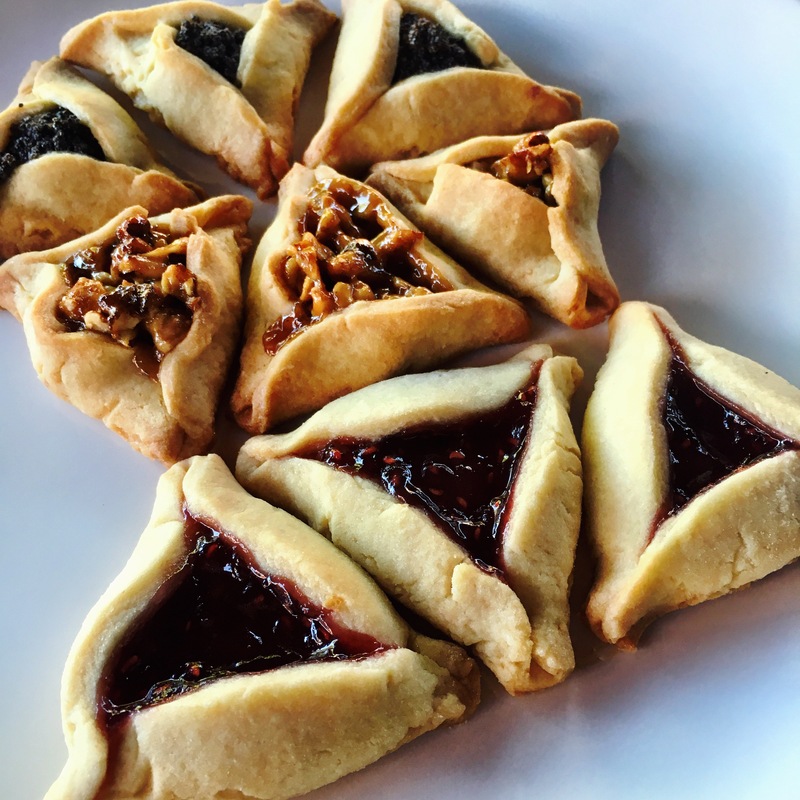 Raspberry, walnut, and poppy Hamantaschen. Happy Passover. Place butter and sugar in bowl and use electric mixer to until light and fluffy. Add the egg, vanilla, and orange zest to the bowl. Beat again until creamy and well mixed. Mix until crumbly dough forms. Knead dough into a ball and then flatten into a disk. Wrap in plastic and refrigerate overnight. Make any fillings you want. Lightly flour a smooth, clean surface. Unwrap the dough disk and place it on the floured surface. The dough will be very firm after chilling. Use a rolling pin to roll the dough out to 1/4 inch thick. At the beginning, it will be tough to roll out– you may need to pound it a bit. A heavy rolling pin works best. As you roll, cracks may form on the edges of the dough. Repair any large cracks with your fingers and continue rolling. When the dough reaches 1/4 inch thickness, scrape the dough up with a pastry scraper, lightly reflour the surface, and flip the dough over. Continue rolling the dough out very thin (less than 1/8 of an inch thick). The thinner you roll the dough, the more delicate and crisp the cookies will turn out– just make sure that the dough is still thick enough to hold the filling and its shape! If you prefer a thicker, more doughy texture to your cookies (less delicate), keep the dough closer to 1/4 inch thick. Lightly flour the rolling pin occasionally to prevent sticking. Place a teaspoon of filling (whichever filling you choose) into the center of each circle. Do not use more than a teaspoon of filling, or you run the risk of your hamantaschen opening and filling spilling out during baking. Cover unused circles with a lightly damp towel to prevent them from drying out while you are filling. Pinch each corner of the triangle gently but firmly to secure the shape. If any cracks have formed at the places where the dough is creased, use the warmth of your fingers to smooth them out. When all of your hamantaschen have been filled, place them on a lightly greased baking sheet, evenly spaced. Place them in the oven and let them bake at 350 degrees for 20-25 minutes, till the cookies are cooked through and lightly golden.